Happy New Year and welcome back for the spring semester. Laura and I are excited to see faculty and students returning to campus and around town. Welcome to the new Hokies who joined us this semester. We look forward to getting to know you better. You have joined a strong university community that is determined to make a difference in the world through our commitment to excellence and service. In October of 2014, I had the honor of formally addressing you during my installation as the 16th president of this dynamic and enduring institution. I shared aspirational themes that emerged in conversations with students, faculty, staff, alumni, and partners during my first months as president. These themes built upon and extended the goals and objectives outlined in our last strategic plan, A Plan for a New Horizon – Envisioning Virginia Tech 2012-2018. In 2015, we embarked on a generational visioning process known as Beyond Boundaries. In conversations, forums, and workshops across our community, the themes that I spoke about in 2014 were validated and shaped around our core values and established strengths, including our living motto, Ut Prosim, (That I May Serve). This vision reinforced our commitment to value, access, and affordability; our rich land-grant tradition of community service and outreach; our strength in interdisciplinary collaboration that leverages the comprehensive nature of Virginia Tech; and our role in the commonwealth as a global portal for talent and partnerships through impactful research and technology development. The Beyond Boundaries vision for Virginia Tech is a challenge on par with the transformation of VPI into a comprehensive university in the 1960s. Such a transformation cannot be achieved in just a few years. It requires a long view with sustained and sustainable actions that must continuously adapt to a changing environment. Our faculty, students, staff, alumni, and partners must work together to continually refine our shared vision. We must be transparent, inclusive, and use the tools of shared governance to build policy and best practices around the elements that prove sustainable. In the past two years, we have initiated foundational projects across the university to align Virginia Tech’s trajectory to Beyond Boundaries. These have included identification of destination and strategic growth areas and the design of a new budgeting model. In addition, we have made good progress developing key priorities to advance diversity and inclusion, experiential learning, and the expansion of Virginia Tech’s reach across the commonwealth. Building off the foundation of the Beyond Boundaries vision, we can now begin to formulate a near-term strategic plan that incorporates and connects current initiatives, tracks our progress, and guides our investments toward our long-term goals. In doing so, we will fully integrate these programmatic priorities into the broader fabric of our land-grant mission of research, teaching, and service. I summarized our progress in my State of the University Address last September. Throughout this calendar year, we will hold open forums, workshops, and campus-wide conversations, and we will provide updates and share our milestones and progress toward our goals. I have asked Dr. Menah Pratt-Clarke, in her role as vice president for strategic affairs, to lead our community in the deliberations that will be necessary to create a transparent and inclusive process for developing our next strategic plan. Virginia Tech excels in many metrics and rankings systems that are designed to evaluate the quality and value of undergraduate education, yet we lag our U.S. land-grant peers in measures of scholarship, academic reputation and global engagement, the measures that feature prominently in rankings of global universities. Virginia Tech is currently ranked between #250 and #350 globally. Achieving top-100 ranking would enhance our ability to attract top talent and partners to Virginia Tech and the commonwealth. A Virginia Tech education is an outstanding value for those with resources, but is not affordable for many students from low- and middle-income families. Taxpayer dollars and growth in tuition rates are projected to be flat or declining in real dollars and will not meet the need for resources that will advance Virginia Tech’s program quality and economic impact. Envisioning Virginia Tech – Beyond Boundaries is the visioning process that started in 2015 with the goal of describing an aspirational vision for Virginia Tech 30 years into the future. By extending the horizon, we were able to consider the impact of long-term societal and economic trends. The visioning process is complete, and a report is available online. Beyond Boundaries offers a foundation for a continually evolving strategic plan to guide and measure our direction forward. As our current strategic plan, A Plan for a New Horizon: 2012-2018, reaches the end of its implementation period, it is time to build our next strategic plan on the foundation of the Beyond Boundaries vision. The most difficult part of strategic planning – defining a compelling vision – is already largely complete. What remains is identifying university-level milestones and metrics that will chart our progress and inform our decisions and priorities. Those milestones and metrics will be informed by the current aspirations and initiatives already underway in colleges and units. This planning cycle will be unlike others in the past. The traditional static six- or seven-year plan no longer makes sense in a world that is changing faster than ever before. While our long-term vision for the future will guide us, the trajectory we take toward that vision must adapt continuously to the sweeping societal, technological, and economic changes that are enveloping us. Just in the past two years, we have seen the ebbing of public support for the undergraduate education mission, the growing importance of deep cross-sector partnerships, and the pervasive narrative around the lack of diversity of political perspective on our campuses. Despite those head- and cross-winds, if we know where we are headed, we can dynamically adjust our trajectory to stay on course. We must be willing to adjust milestones and metrics as the reality of our world changes. As we move into planning, it is time to re-examine the “why” behind each of our goals and initiatives. What is driving a particular long-term goal? What are the principles behind the initiatives that have already been launched? The following outline defines several of our major goals and initiatives and strives to answer the question, why? – why are these goals and initiatives critical to Virginia Tech’s success in the future? Today’s society is increasingly internationally integrated and a global perspective is quickly becoming an imperative to success. Becoming a Top-100 Global University is an indicator of excellence and an essential part of becoming a destination for global talent and partners and generating the economic activity Virginia needs. Although global rankings do not capture the full picture of who we are as an institution, they do assess our competitiveness for talent in a global marketplace. Most of our peer institutions appear in Top-100 lists. In fact, 18 of Virginia Tech’s 25 SCHEV peers are in the Top-100, as are the U.S. land-grant institutions that we view as aspirational peers. Virginia Tech is currently ranked between #250 and #350 in the most prominent rankings. Although we have much work to do, we are making progress on the metrics that define the top global universities, including evidence of faculty scholarship, faculty awards, internationalization of faculty and students, global partnerships, and competitive grant funding. It is these metrics that align with attracting talent and enhancing the impact of a university on the communities they serve. Scale offers important advantages, including: the ability to offer academic programs that are strong across all three mission areas of learning, discovery, and engagement; increased operational efficiency, generating resources that can be invested in affordability and program quality; and the opportunity for more students to earn Virginia Tech degrees, an important element of our land-grant mission and a response for the steadily growing interest in Virginia Tech among prospective students. Land-grant research institutions like Virginia Tech have the most comprehensive missions of any class of university. As such, these institutions tend to be larger than universities with more limited scope. Countering these advantages is the desire to preserve the strong sense of community and small-campus feel of Virginia Tech. What is the right size for Virginia Tech? All of the dozen land-grant institutions ranked ahead of Virginia Tech are bigger than Virginia Tech. Their undergraduate populations range from 27,000 to 49,000, with a median of 34,000. While there is no direct causal relationship between institutional quality and an undergraduate enrollment of about 30,000 or more, the advantages of scale outlined above strongly support the hypothesis that the benefits of scale become apparent for land-grant research universities at an undergraduate enrollment of about 30,000. When we started to plan for growth back in 2014, Virginia Tech had about 25,000 undergraduates. Our current plan takes us to 30,000 by 2023. Growth stresses some systems and allows others to approach peak efficiency. This plan for growth allows us to provide the breadth of high-quality undergraduate opportunities and to sustain programs critical to the undergraduate experience while continuing to keep access and affordability for Virginia residents a priority. In that light, we must continue to adjust our rate of growth to match the growth of critical infrastructure, available faculty and staff effort, and financial resources. And, we must preserve the strong campus community that strives to ensure that every student feels engaged and supported. InclusiveVT is our institutional and individual commitment to Ut Prosim in the spirit of community, diversity, and excellence. It is core to our role as an engine for social and economic mobility, for attracting talent from the broadest pools possible, and for ensuring that all of our students have on-campus experiences that prepare them for the world they are about to enter. First, our students and their future employers expect a learning environment that is diverse in every dimension, from life experience to disciplinary expertise to diversity of thought. Studies show that diverse teams produce better solutions. Second, living the university motto, Ut Prosim, requires empathy and cultural competence that can be developed only by interacting with those one is aiming to serve, addressing every opportunity and challenge through the lens of improving the human condition. Finally, Virginia Tech’s history as a land-grant institution is rooted in providing opportunities to those who have been traditionally disadvantaged and underserved. We have the obligation and the demographic imperative to expand the pools of talent from which we recruit as broadly as possible. InclusiveVT aims to create an inclusive environment at Virginia Tech that supports diversity and allows the three objectives described above to become part of every student’s Virginia Tech experience. We have committed to doubling the underrepresented minority percentage of the entering undergraduate class to 25 percent and increasing the underserved and underrepresented percentage (including first-generation and Pell-eligible students) from 25 percent to 40 percent by 2022. This transformation will only be sustainable with comparable efforts to diversify staff and faculty. VT-shaped Learning: Our students and their future employers increasingly expect the university learning environment to engage objectives beyond mastering a discipline, or “major.” One of the themes of Beyond Boundaries is the concept of the “VT-shaped” learning environment: depth in at least one discipline; the opportunity to build communications, critical thinking, design thinking, teamwork, and analytical skills by working on complex problems with diverse teams; and the “V” supporting the “T” through purpose-driven experiential learning in realistic environments. Overlaying the “V” is the lens of Ut Prosim. Overlaying the “T” is the ability to leverage technology, a literacy now considered an imperative and a Virginia Tech area of strength. Many of Virginia Tech’s academic programs already incorporate several of these characteristics, and many of our students create this experience for themselves through individual initiative, with multiple majors and minors. In the long term, Virginia Tech will work toward building these features into every student’s experience. Destination Areas: The greatest challenges and opportunities for the coming generations must be addressed from a transdisciplinary perspective. The wide range of disciplines at Virginia Tech allows students, faculty, and partners to take on these challenges and opportunities employing biomedical and physical sciences, engineering, technology, social sciences, humanities, and the arts in a holistic manner. To create VT-shaped learning environments, the university itself should be VT-shaped with cross-cutting excellence and unique programs. To establish cross-cutting capability, Virginia Tech has created five initial Destination Areas (DA), each representing a theme within which Virginia Tech already has nationally or globally recognized strengths. Each DA connects disciplinary strengths to create distinctive and high-impact programs that attract globally leading talent and partners who amplify or complement these strengths. Each DA spans teaching and learning, discovery, and engagement and is rooted in improving the human condition in the spirit of Ut Prosim. A successful DA expands experiential learning opportunities for students, elevates research opportunities for our faculty, and leverages cross-sector partnerships to enhance economic development and opportunity in our communities. DAs augment disciplinary strengths and interdisciplinary institutes. As a DA matures, it may be absorbed into the academic fabric of the university, and it may be replaced by an emerging DA. Emerging DAs – also referred to as Strategic Growth Areas – derive from disciplinary strengths, interdisciplinary centers and institutes, and cross-disciplinary collaboration. The National Capital Region: As a global capital, the NCR offers a unique urban living-learning laboratory to complement and leverage our Blacksburg campus. The NCR has all the hallmarks of robust innovation economies, including tremendous talent, high-tech firms, government agencies and research, and access to partners and capital. Many of our partners, alumni, funders, and prospective graduate and professional students are located in the NCR or can easily travel to the NCR, putting them in close proximity to a vast array of experiential learning opportunities. The NCR also provides a critical connection to global and policy partners. Compared to similar metropolitan innovation economies in the U.S., the NCR is under-resourced in research university capacity to drive the development of a more diverse and resilient regional economy. Many of Virginia Tech’s world-class strengths are aligned with the future growth opportunities for the NCR economy, including data and decisions, autonomy, and security. Yet, Virginia Tech’s presence in the NCR is modest in scale. There is substantial potential for growth in our research, technology, policy, graduate education, professional education, and experiential learning portfolios in the NCR. Growth in the NCR will enhance Virginia Tech’s global profile, attracting the talent and resources we will need to serve as a catalyst for the regional economy. The VTC Health Sciences and Technology (HS&T) campus in Roanoke: Growth of the Virginia Tech Carilion School of Medicine and Research Institute in Roanoke will enhance the NIH-funded portion of our research profile, provide experiential opportunities for Blacksburg-based HS&T undergraduates, and be a showcase for the role of a modern land-grant university in catalyzing economic development through attracting talent, partnering and community engagement. Our partnership with Carilion Clinic is entering its second decade with great momentum. It is here that our HS&T portfolio will grow by leveraging Blacksburg’s HS&T strengths in a clinical environment. Other opportunities exist to foster a sustainable community and economic growth in Roanoke, such as expanding our community engagement and developing a pipeline to success for K-12 students. Master Plan: The Beyond Boundaries visioning process has developed in parallel and in close coordination with the Master Plan for the campuses in Blacksburg, the National Capital Region, and Roanoke, as well as the Agricultural Research and Extension Centers distributed around the commonwealth. Expanding Philanthropic Giving: Philanthropic giving enhances the endowment and provides current-use resources that allow Virginia Tech to advance its priorities in access and affordability, capital projects, programmatic excellence, and talent recruitment and retention. Before 2016, Virginia Tech had been averaging about $80 million annually in cash, and a similar amount in annual gifts and new commitments. The giving rate for alumni was 9 percent. Based on peer land-grant universities of similar size, our annual new gifts and commitments should be about $250 million and our giving rate should be above 20 percent. Under our new integrated approach to Advancement – bringing together alumni relations, university relations, and development – Virginia Tech is making strides in both cash ($125 million in FY17) and new gifts and commitments ($162 million in FY17). We have set a milestone of 22 percent giving by 2022 (currently at 12 percent), and we expect to reach a sustainable level of $250 million in new gifts and commitments by 2027. Partnership for an Incentive-Based Budget (PIBB): The university’s financial environment is changing. Taxpayer dollars and tuition growth is constrained to inflation, while the cost of advancing innovation and quality will increase at a greater rate. We must effectively leverage all university assets – money, people, and space – to ensure a sustainable future. Virginia Tech has taken the bold approach of designing a data-informed budgeting model that is based on college-level aspirations and performance. The Partnership for an Incentive-Based Budget (PIBB) requires a rich and heterogeneous database that offers flexibility in outlining key metrics that will define the dimensions of success at the college level. Most of our peers have migrated from historical or incremental budgeting to incentive or performance-based budgets that are designed to reward continuous improvement. These budget models are transparent and data-informed, but they tend to be retrospective rather than prospective. In other words, they reward past performance without creating opportunities for unit-level investment. Most of these models are also one-size-fits-all, with a limited set of metrics that are designed to work across the entire university. The PIBB is a data-informed rather than a data-driven approach that requires frequent conversations and negotiations between deans and the provost to ensure that the model does not drive undesirable outcomes. Much work remains to build out the PIBB. Faculty input is critical, and data sources must be verified. The nature of the PIBB is that the model itself must “learn” from experience. The PIBB, the Destination Areas, InclusiveVT, and our emphasis on philanthropy will make Virginia Tech more competitive for large-scale projects anchored by external sponsors, including industry, foundations, and government. To ensure that we are in a position to develop new opportunities, we are restructuring our research and innovation support infrastructure to provide the services needed to support a major global research university. This “Focus on Function” approach highlights three domains: improving our support for large high-impact projects, enhancing faculty resources for proposals and post-award project management, and strengthening our innovation ecosystem. Realizing the Beyond Boundaries vision for Virginia Tech is a challenge on par with the transformation of VPI into a comprehensive university in the 1960s. Such a transformation cannot be achieved in a year or even in a decade. It requires sustained and sustainable actions that will include course corrections as the environment around us shifts in unpredictable ways. It requires that our faculty, students, staff, alumni, and partners work together to continually refine our shared vision. It requires that we all take some risks and that we are ready to change course when indicated the right course of action. It requires that we be transparent, inclusive, and use the tools of shared governance to build policy and best practices around the elements that prove sustainable. A vision that is shared and a plan that is both aspirational and realistic provide a framework for decision-making that is inherently efficient and self-propagating. As we move forward we will hold open forums, workshops, and campus-wide conversations. We will provide updates and share our milestones and progress toward our goals. 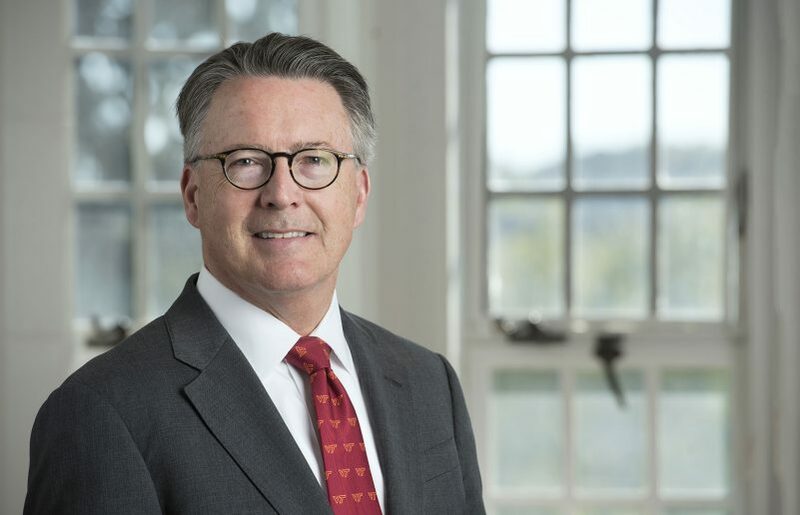 I am asking you to support our university by engaging as your available effort allows in developing and implementing our next strategic plan on the foundation of the Beyond Boundaries vision for the future of Virginia Tech.